The competition on Saturday was equally fierce. FM Nelson Castaneda and Michael Ainsworth joined CCFC regulars NMs Daniel Lowinger and Kapil Chandran in a very tough top quad. Second seeded Lowinger took advantage of a little luck to defeat Chandran in the first round after Chandran lost on time in a dead drawn ending. However, Lowinger proved that he did not need luck to win the tournament as he crushed Castaneda in their final round encounter to win the section with a perfect 3-0 score. Quad 2 was tightly contested. All of the players were rated within 100 points of each other. Ultimately nobody was able to take the decisive lead and in the end there was a three way tie for first between Hubert Herring, Melvin Patrick and Leo Bykhovsky. 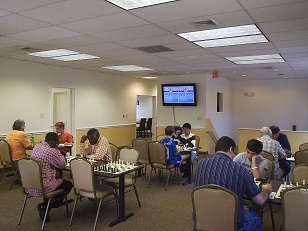 Quad 3 marked the return of Zachary Filler to competitive chess after a brief hiatus over the summer. Although he was the clear favorite by rating, no one can afford to underestimate the danger of playing against young rising stars. Filler quickly showed that he still has what it takes and held off fierce competition from Grant Wang, Jack Von Riesemann and Al Pinto to win the section 3-0.